In case you don’t know, Meatless Monday is a movement to reduce meat consumption and improve health (of people and the planet) by suggesting that one go meat-less on Monday. I really like the idea of this program, because it doesn’t force one to become vegetarian/vegan, and it focuses on reduction, not elimination. Let’s face it, the country is not going to stop eating meat altogether, and neither am I (yes, I know, I was vegan for a month- but that’s it). Meatless Monday is a really nice way to focus on alternative proteins/vegetable based dishes, at least once a week. And if that spills over into more than once a week, so be it. This week, I’ve been inspired by one of my favorite foods: mushrooms. I’ve discovered recently that mushrooms often elicit really strong reactions- some people really, really hate them, citing the fact that they don’t want to eat a fungus. To each their own, but I think if you don’t eat mushrooms you are missing out on one of the great umami experiences food has to offer. The recipe below can be made with cremini, portobello, or a mixture of exotic and ordinary. 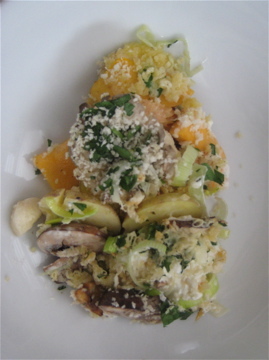 I used a base of white mushrooms, supplemented with these three treasures (pictured above). 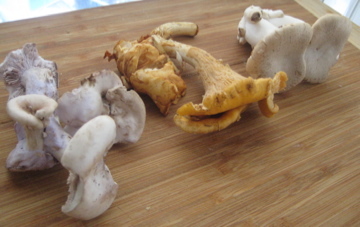 Chanterelle: These have a chewy texture that holds up well, and a peppery undertone. Bluefoot: These are meaty, tasty, and oddly colorful. French Horn: These are actually just very large oyster mushrooms. Meatier than chanterelles, they have a mossy, earthy taste. * I kind of hate the word casserole, it’s so 1950’s/tv tray. But, oh well. 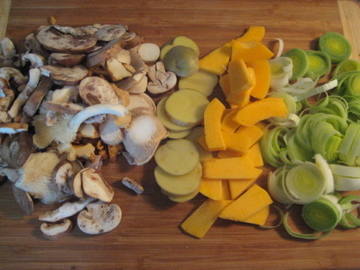 Preheat oven to 375, then start by chopping your vegetables so they are all of about the same thickness. There will be two layers to this dish, so divide your vegetables in half, one for each layer. 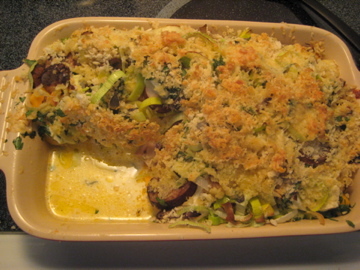 Put a layer of potatoes in the bottom of your baking dish, top this with the squash, then the mushrooms, then the leeks. Sprinkle the parsley and sage over this layer, as well as some salt and pepper. Add half of the butter, separated into slices and placed evenly around your dish. Pour half of the cream evenly over this layer, then squeeze the juice of 1/2 lemon over the top. 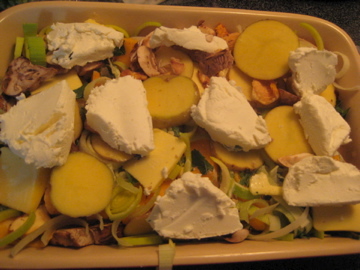 Start your second layer with another row of potatoes, then cut the goat cheese into slices and place evenly around dish. It helps to keep the cheese in the fridge until you are ready to use it- it will cut much more easily when it is still firm. 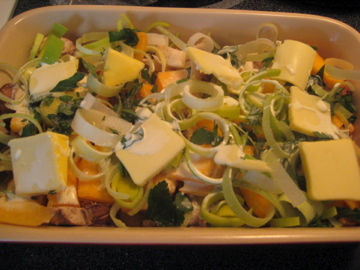 Finish the second layer off with the rest of your squash, mushrooms, and leeks. Again, add pats of butter, the other half of your lemon, and the rest of your cream. Sprinkle with salt and pepper, then top with bread crumbs. Bake at 375 for 30 minutes*, then let rest for 10 minutes before serving. Voila. Note: Bake time really depends on the size and depth of your dish. The larger the dish, the less time you will need because more surface area will be exposed. Really, you need enough time for your potatoes to get tender and for the cream and butter to soak into your vegetables (and strip away every ounce of their nutritional value). In my small dish it took 30 minutes for everything to meld properly, but in a larger dish you may only need 20.